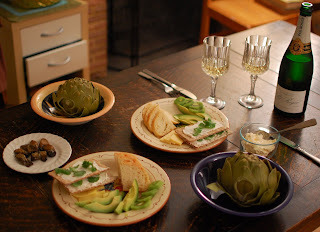 Last night, I prepared a dinner of individual nibbles, instead of having a single big dish. It was delicious, and allowed a slow pace for chatting and sipping the bubbles. The artichokes were maimed to allow them to fit in the steamer. Before their sides were trimmed down, the lid wouldn't fit, and the steaming would have been rather ineffective! Also pictured are smoked oysters, Dubliner and Jarlsberg cheeses, avocadoes, and kiwifruit.